A majority of the 49 people killed at the Pulse nightclub were Hispanic, and about half were of Puerto Rican descent. 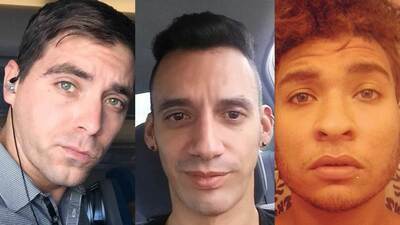 ORLANDO, Florida – Authorities in Orlando continued Monday to update the list of names of the 49 victims killed in the Sunday attack at Pulse, a gay nightclub, during a Latin party attended by more than 200 people. A total of 48 victims have been identified; most are men under 30 and Hispanic, and about half are of Puerto Rican descent. The attack, which has been attributed to Omar Mateen, who claimed to be a follower of the Islamic State, also left 53 wounded. The shooter died, but authorities say he is not a victim, which is why the death toll stands at 49. It was the worst mass shooting in U.S. history. Of the 47 victims' names released so far, 36 have Hispanic surnames. Puerto Rico Deputy Secretary of State Rolando Padua said today that 90 percent of the victims are Latinos, according to Orlando authorities. Of those, about half are of Puerto Rican origin. Also today, Mexico's Foreign Ministry released a statement saying that three Mexican nationals were killed in the Pulse nightclub massacre. While the ministry did not release names, Univision News confirmed one of the Mexican victims after speaking to his family: Miguel Ángel Honorato, 30. A father of three, he came to the United States in 1991 aged four and lived in Apopka, Florida, where he worked for a Mexican food service company. Friends and family gathered to listen to Mexican music in his memory on Monday. "He was a hard wroker who never quit," said his brother José Honorato. Among the victims were a student, a pharmacy tech and a travel agent. These are some of the details emerging as victims are remembered by family and friends on social media. Edward “Eddie” Sotomayor, a native of Sarasota, was one of the first victims to be identified. Sotomayor, 34, was well known in Orlando’s LGBT community as the national brand coordinator of ALandCHUCK Travel, an agency specializing in gay travel with 11 offices across the country. He had worked there since August 2014. Al Ferguson, one of the owners of the agency, received a message from Sotomayor just 20 minutes before the shooting began inviting him to join the party at Pulse. “One of the saddest days of my life,” Ferguson wrote on his Facebook page, where he shared several photos of him with Sotomayor. “I'll try to start finding the good in all this. Tomorrow." Those who knew Sotomayor say that he was friendly, jovial and funny. A friend, Nate Carrick, told a local television channel that he was "devastated to see the name of my friend Edward Sotomayor on that list." "He was a person who was always part of the fun," David Sotomayor, the victim’s cousin, told the Associated Press. According to his LinkedIn profile, Sotomayor graduated in 2012 from the University of South Florida as a radio journalist and then took courses in communication at the State University of Florida, in Manatee. Relatives of another one of the deceased, Stanley Almodovar, left messages of condolences on his Facebook profile. "Rest in peace" and "I cannot believe you're gone," read some of the dozens of comments. His mother Rosalie Ramos, received a phone call at 2:00 a.m. telling her to come quickly to the nightclub. "I was hoping maybe [he was shot in] the hand or the leg," she told the Orlando Sentinel. "You can survive [a gunshot to] the leg." But Almodóvar, 23, was hit by three bullets in the stomach, chest and side, and he died shortly after arriving at the hospital. Originally from Springfield, Massachusetts, Almodóvar lived in Clermont, Florida. He graduated from Clermont's East Ridge High School in 2011 and studied to work in a pharmacy. Luis S. Vielma, 22, worked at Universal Orlando theme park on the Harry Potter ride. J.K. Rowling, the author of the Harry Potter series, wrote an emotional message on Twitter. "Luis Vielma worked on the Harry Potter ride at Universal. He was 22 years old. I can't stop crying. #Orlando"
In one of the last public photos posted on his Facebook page, Vielma is with a group of friends in front of the Cinderella Castle in Magic Kingdom. The caption reads: "Friends who become real family." According to his profile, he was studying to be a physical therapist assistant at Seminole State College. Also 22, Peter O. Gonzalez-Cruz studied at Cologne High School in New Jersey and was working for UPS, according to his profile on Facebook, where he identified himself as Peter Ommy. Puerto Rican Eric Ivan Ortiz-Rivera, 36, had moved to Florida to improve his career prospects. He studied at the Central University of Bayamon and lived in Miami, according to his Facebook profile. He had been married for just a year to his partner, according to his cousin Orlando Gonzalez, who described him as a "very artistic" person to The New York Times. Juan Ramon Guerrero, 22, who was at the club with his boyfriend Christopher Leinonen, whose whereabouts are unknown. In an interview with ABC, Leinonen's mother Christine said a friend of Christopher's told her he saw an injured Guerrero in an ambulance, but he did not see her son leave. Amanda Alvear, 25, a Latina of Puerto Rican descent, was filming on Snapchat when the shooting occurred. Her brother confirmed her death on Facebook. A relative of Puerto Rican Ángel Luis Candelario Padró, 28, confirmed his death in an interview with Univision News. "He was a humble kid, studious, he liked working. He wasn't a partier. In fact, he didn't want to go to the club; [his friends] insisted," said his aunt Leticia Padró.